Posana Cafe: What brunch in Asheville looks like. Food, glorious food! The only thing that could make Asheville food better is if you ate it after sleeping late on the weekend, and had some booze and/or coffee along with it. Let’s slap a side of biscuits & gravy on that idea on that idea and call it brunch in Asheville. Here’s our picks. Not all restaurants listed serve brunch year-round. Brunch may not be served every day of the week. It’s always a good idea to call first to check hours, availability, parking and any need for reservations. Plant: Vegan. Brunch. You know you’re in Asheville when you can have a vegan brunch. Deal with it. Moby ate here and raved about his experience, as did Dennis Kucinich. Menu. Stoney Knob Cafe: Greek/Mediterranean restaurant actually in Weaverville, but a short drive from downtown. Absolutely knockout American/Southern brunch with huevos rancheros and blackberry crepes. The Greek coffee and hot chocolate are delicious. Don’t let Weaverville hog all the fun. Menu. The Grove Park Inn: The fanciest place in town to brunch. There’s a decadent brunch at the Blue Ridge Dining Room. Be warned of the $10 parking fee for non-guests. Luella’s Bar-B-Que: Barbecue restaurant with a live-music, southern-style brunch and $6 BLT Bloody Marys (your glass is rimmed with brisket rub and garnished with bacon, lettuce, and tomato wedges). Sunday brunch only. Avenue M: Sunday brunch only, 10-2:30. Sea scallops, eggs Florentine, breakfast burritos & multigrain hotcakes.And $5.50 grapefruit margs. Family-owned on Merrimon. Menu. The Corner Kitchen: Good enough for President Obama and First Lady Michelle. Plaques commemorating their visit for dinner are on the table near the top of the stairs. Some of Asheville’s best fried chicken is on the brunch menu only, along with pomegranate blueberry mimosas and an Andouille sausage scrambler with peppers, onions , and cheddar cheese with grits & a biscuit. Brunch Sat. & Sun. The Biltmore Estate: Another destination brunch for special occasions (or when you really want to splurge), the Sunday brunch buffet at the Deerpark restaurant doesn’t have much local color, but does have plenty of indulgence. Frankie Bones Restaurant and Lounge: Benton’s Bacon pancakes and a Bloody Mary bar. Brunch starts at 11, cocktails at noon. Brunch on Sat.-Sun. only. Menu. Over Easy: Three words: Lavender. French. Toast. You’re welcome. Possibly the most underrated brunch and breakfast spot in town. Top-notch breakfast and brunch includes eggs Benedict with mushrooms, garlic, capers, fresh herbs and marinated Hickory Nut Gap skirt steak. Also vegan biscuits & gravy. Heavenly. Posana Cafe: Oh Posana. 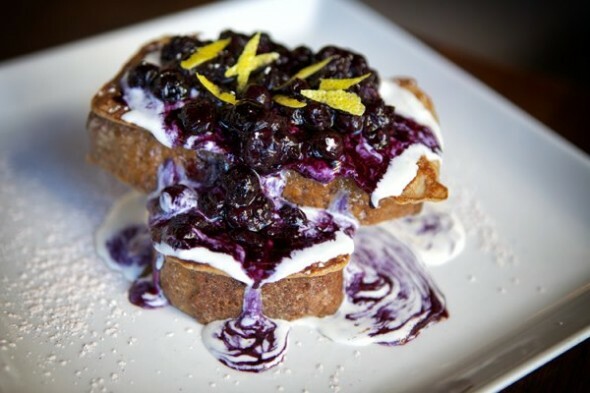 As if your sweet side patio with its charming view of the Jackson Building was not enough, you must also give us French toast stuffed with lemon ricotta and topped with blueberry brandy compote (pictured above). And everything is gluten free. And author Neil Gaiman ate here with Charles Vess, Edgar Oliver and George Dawes Green. Menu. Laughing Seed Cafe: Not only do we have a vegan brunch, we have a vegetarian brunch. Farm-to-table veggie cuisine that could seriously make people rethink vegetarian food. Brunch 10-2 Sundays. Menu. The Southern Kitchen & Bar: Patio seating (some of the best in Asheville) & Yacht Rock Brunch on Sundays, noon to 3 p.m. Bloody Mary bar for $5 and half off all bottles of wine. Website. Limones: Nouveau Mexican and cozy, romantic decor. And amazing habanero and pomegranate margaritas. Brunch is Saturday and Sunday only, and includes poblano-smoked duck sausage burritos, smoked chipotle chilaquiles and Mexican hot chocolate with churros. To die for. Reservations recommended. Menu. Table: Serving seasonal farm-to-table fare. Sunday brunch only. French toast, shrimp & grits and killer Lake Lure fried chicken. Menu. Mayfel’s: A little touch of New Orleans in Asheville, with beignets on the menu, funky decor and possibly the best courtyard in town. Also killer Benedicts, great tofu scramble, shrimp & grits, French toast and more. Breakfast/brunch until 4 p.m. daily. Menu. Early Girl Eatery: A top Ashvegas pick. Farm-to-table Southern cuisine that was locally sourced before local sourcing was cool. Breakfast all day includes quickbreads, quiche, creative seasonal specials and some of Asheville’s best egg breakfasts. No cocktails, but the coffee (and the service) is great. Kid-friendly, too. Menu. The Junction: Welcome to The Junction, home of the honey-pecan pull-apart cake, pork brunch tacos, and biscuits with mushroom-sage gravy and Dijon creme fraiche. 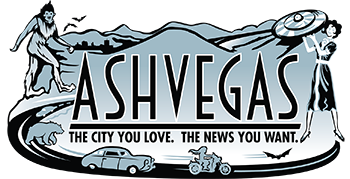 Just say yes to how we roll in Asheville! Menu. Cafe Azalea: Migas, wild mushroom omelets, pastrami & eggs, lemon ricotta pancakes. Patio dining. Brunch on weekends only. Scroll down for the brunch menu. Sadly, Cafe Azalea has closed. DeSoto Lounge: Weekend brunch starts at noon. The menu can include breakfast pies (mushroom, egg and cheese or broccoli, egg and cheese), “brunch bake,” the spicy breakfast burrito, banana waffles and chicken and waffles. Apricot-mango mimosas and a Bloody Mary bar. Sunny Point Cafe: Regarded by many as the best breakfast and brunch place in town, if not in the universe, the Point is the place to go for your morning meal. An Ashvegas pick for breakfast and brunch. Some of the greatest omelets and huevos rancheros ever made. Check out the sweet kitchen garden by the parking lot. Menu. Half an hour away in Black Mountain: Louise’s Kitchen, home to creative local cuisine. Sunday brunch 10 a.m. to 2 p.m. Menu. And it’s in Fairview, but still a hit: The Local Joint. French toast, pancakes, eggs Benedict, biscuits and gravy, huevos rancheros. Brunch until 3 p.m. Double check Cafe Azalea. I was just there – under new ownership. Not sure about Brunch though. I had lunch there early summer 2013. Ron, Cafe Azalea is indeed open under new ownership. Haven’t been there yet and can’t say if I’d put it on this list. WALK in West Avl has a great brunch! I was pleasantly surprised. Excellent bloody Mary too. Chestnut! From the owners of Corner Kitchen. 48 Biltmore Avenue, Across from the new Aloft Hotel. Classic Eggs Benedict, Fried Chicken, House made doughnuts! you didn’t include The One Stop’s bluegrass brunch every Saturday and Sunday!!! Sanctum Sully hosts and plays on the Saturday brunch and The Pond Brothers host and play on the Sunday brunch. I WILL be checking these out! So I think we’ve established that pretty much every restaurant in the area serves some type of brunch. Cafe Azalea on Tunnel in the O-teen is yummy! WALK has a really good brunch in West Asheville. The Fried Chicken & Gravy is one of the best things I’ve ever had. What about the Morning Glory Cafe in Black Mountain? One of my favorites. They open daily at 8AM for breakfast. Biscuits and gravy are tops. Try the Mountain Man Breakfast. i like Morning Glory! good one, Bob. Have to give a shout out to Avenue M in north Asheville. Thanks for this list. Brunch is my favorite meal and now I have some new places to try. Another great brunch is Cafe Azalea. I recommend the lemon ricotta pancakes. Filo Bakery also offers the best cherry cream cheese Danish I have ever had. Filo’s a hidden gem. Thanks for the tip! Where is Filo? Did it make the list? Filo is a bakery, so no appearance on the list. It’s by the Ingles across from Riceville Road in East Ashe. Odd, interesting stone building (like a little castle) and great coffee and treats. I’ll take you there! If it takes you 30 minutes to drive from Asheville to Black Mountain, you are going way too slow. Or you’re coming in from West Asheville. Jerusalem Garden does brunch downtown too. Woaw now! You seem to have forgotten Mayfels. Not only are we some of the hardest working restaurant people in Asheville, we have one of the best brunch locations, the courtyard, as well. Mayfel’s is great! Glaring omission corrected! Is GPI still charging their ridiculous $10 parking fee? Thought that was just during the Gingerbread competition…..??? I love 1896 (right next to Posana) downtown. Sat/Sun brunch or lunch, you can’t go wrong. I love the brunch at The Junction…always creative and fabulous! I like Frankie Bones for South Asheville – They have a sweet Bloody Mary bar and I dig the Tenderloin Benedict I had last week. Think they started opening on Saturday’s for brunch recently, too. Ugh, Grove Park Inn, no. That and Deerpark in Biltmore, they’ve gotten so ‘touristy’ that they herd you through like cattle and the quality has gone downhill. Haven’t tried any other Grove Park restaurant, but have dined at The Bistro several times at Biltmore and they’re wonderful. Sorry, didn’t see the word ‘brunch’ in the title. They have a lunch and dinner menu at Bistro, but I stand by my opinion of the food quality at the former mentioned. There’s an Over Easy in North Asheville?? Since when is Over Easy in North Asheville? Did Limones move? Their website still says Eagle St. I don’t think they moved. Still there AFAIK. Keep the suggestions coming! We’ll add them! Jennifer, I’d like to take a moment to point out that not only is there brunch during the cold months at The Southern Kitchen and Bar, unless it’s unbearably cold I’m still spinning Yacht Rock outside. Furthermore, it’s every Sunday. I freeze my little toes off to provide smooth music that is worth eating and drinking to. If I’m not outside I’m inside. Yacht Rock cannot be stopped. It’s a late brunch. Starts at 12, ends at 3. I play music from 1-5 typically. Bloody Mary bar for $5 and half off all bottles of wine. I have beaten and flogged myself appropriately. That’s never necessary. Thank you so much for amending the listing! Jennifer – You’ll need to treat yourself to a Sunny Point brunch after all that flogging. I have not been but I have heard that brunch at the DeSoto Lounge is great. And a Bloody Mary bar! What about Frankie Bones!!! It is awesome!!! They just added Saturdays – 11-3 as well. Awesome list, btw.